Entire nation has been in deep shock and anguish over the deplorable incident of Shopian in which two women were allegedly raped and murdered. While the relatives of the victim and people blame C.R.P.F stationed in that area as the Culprits involved in this shameful act government despite promising quick action has been callous towards taking any head way in the inquiry of this incident as reportedly even F.I.R hasn’t been registered yet in the concerned police station. The probes called after such kinds of gross human rights violation have miserably failed to punish the perpetuators of these dastardly acts and this has been the prime factor that people have lost trust over these inquiries. And more so the unbridled powers enjoyed by troops under different draconian laws have make them to behave above the law of land. There have been protests over this incident and it is quite natural, but the way authorities have dealt it with brute force resulting in killings and injuries to hundreds of youth can prove disaster for the government as this can pave way for the mass agitation on the pattern of last year. So it is better for the government to come up with truth and take stern action against the culprits in their own interest and restrains from putting restrictions on the pro-freedom leadership. This heart rending incident has provided ammunition to the opposition part P.D.P to fire at the government. but the memory of people is no so short that they will forget the gory incident of similar nature of Badra Payeen, Handwara where in November 2004 troops raped mother daughter duo and then government led by Mufti Sayed at first even denied the reports and then tried to hush up the case. Then in opposition N.C had also led demonstrations against it. Kashmiri people have no trust over these sycophants who do this political gimmickry just for power and to enjoy the perks and privileges. These regional pro-India parties who are collaborators of New Delhi in their every heinous crime have been rejected and subjected to disgrace even in Jammu last year when they were kept hostage at airport for hours and on sangarsh samiti protest were made to sit outside on Aug 9. If at all they are sincere they should stop running with hare and haunting with horn and stop running passive “separatism” when they get out of power to gain public sympathy. Rather they should work for the realization of national aspirations of people of Kashmir, which is complete independence of Kashmir. People of Kashmir have proven time and time again their full commitment towards the struggle for independence and sovereignty and it is up to India to shun the obduracy and rigid stand and cooperate with Pakistan and pro-freedom leadership of Kashmir in working towards finding a durable solution to the vexed issue of Kashmir. The rejection of India towards the offer of talks from Pakistan Prime Minister Syed Yousuf Raza Gilani has putted spanner in the efforts of building a stable atmosphere in the sub-continent but India can’t run away from fulfilling its international obligations on Kashmir forever. 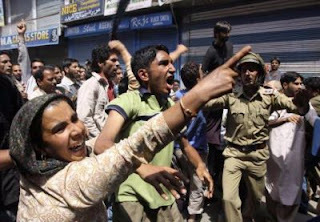 As due to its domino effect Kashmir turmoil can engulf the peaceful areas of India. Soon India understands it the better for her.